The best things come in threes. And fives. 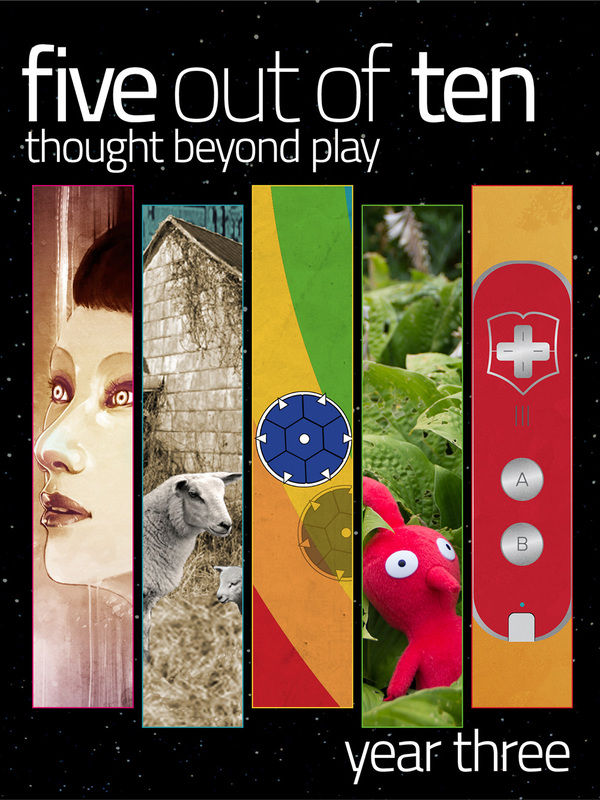 Delve into the third year of Five out of Ten – Soul, Future, Luck, Nature, and Control – in one special edition with over 100 features across over 450 pages of outstanding videogame culture writing. This anthology was made possible through the support of the Five out of Ten Patreon. “Your words are as empty as your soul!” Hear the stories of Rogue Legacy, enter the rhythm game community, learn about the games time left behind, trace the fall of Max Payne, explore adolescence in Kingdom Hearts. “Shape the future.” Cinema, game theory, fathers, strong female characters, the torture of choice. “Make your own luck.” Sports, solace, stigma, sacrilege, study. “One with nature.” The Dirty Dozen of Mass Effect, a virtual odyssey through Enslaved, the civilians of Command and Conquer, going beyond Baldur’s Gate, and the man / machine cyborg divide of Zone of the Enders 2. “Take Control!” Dragon Age and relationships, the fall and rise of the joystick, the challenges of the infinite galaxies of Elite: Dangerous, how wargames depict the unpredictability of war, and the awe-filled pilgrimage of El Shaddai. Featuring writing from: Stephen Beirne, Mitch Bowman, Bill Coberly, Ian Dransfield, Matt Duhamel, Nate Ewert-Krocker, Denis Farr, Bruce Geryk, Tom Hatfield, Austin Howe, Ria Jenkins, Jake Muncy, Mark R Johnson, Lindsey Joyce, Soha Kareem, Paul King, Richard Moss, Michelle Perez, Lindsay Robertson, Carly Smith, Ed Smith, Oscar Strik, Matt Thrower, Carli Velocci, and Alan Williamson. Your purchase contains a collector’s edition Year Three PDF, MOBI and ePUB.